The RTI Portal of the Office of Development Commissioner, CSEZ is created as per the directions of the Ministry of Commerce and Industry for proactive disclosure of information. This site showcases information to be published by every public authority under Section 4 of the RTI Act 2005 and statistical information in respect of various schemes monitored by this office. There is provision for creating logins for the users like RTI user, Vendors, CSEZ Clients and view status of their RTI applications, tenders, requests, etc. All the payments in the form of Bank Drafts, Demand Drafts, Cheque, Indian Postal Order etc. may be drawn in favour of Pay & Accounts Officer, Cochin Special Economic Zone. Cash payments may be deposited with the Cashier in Cash Section, Office of the Development Commissioner, Cochin Special Economic Zone, Kakkanad, Cochiin-37 and a receipt for the same may be obtained and attached with the application. 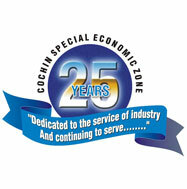 A request for obtaining information under sub-section (1) of Section 6 of RTI Act 2005 shall be accompanied by an application fee of Rupees ten (Rs.10/-) by way of cash against proper receipt or by demand draft or bankers cheque or Indian Post Order payable to the Pay & Accounts Officer, Cochin Special Economic Zone.